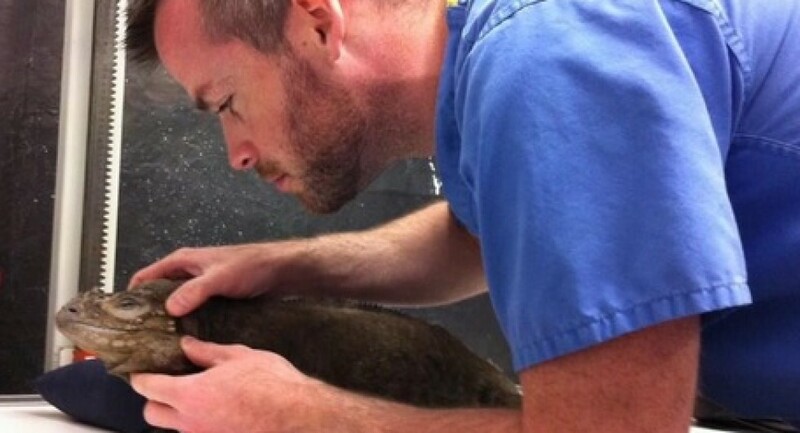 Lungworm in dogs, but what about in reptiles? 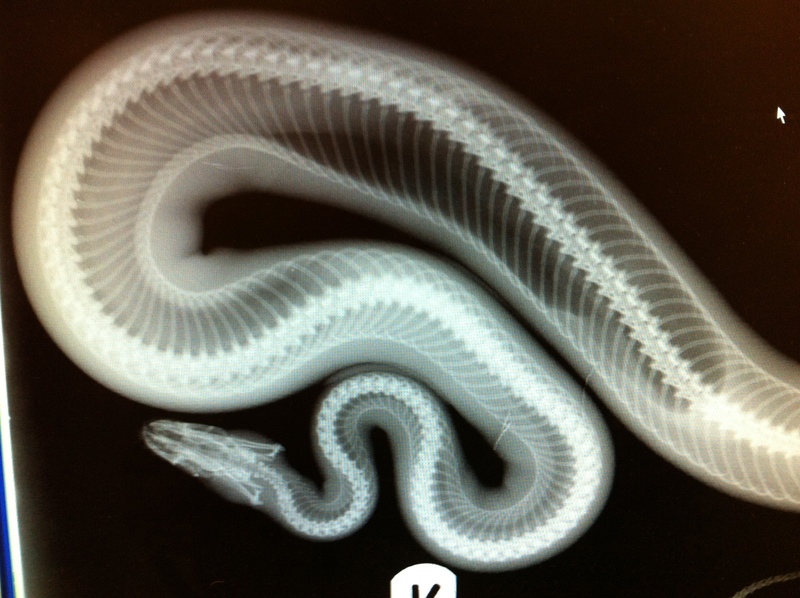 However, I’ve recently been asked about the risks of lungworm for pet reptiles on an exotic forum I contribute to. Some reptile keepers were discussing feeding snails to their lizards and wondered if this parasite could be passed on considering slugs and snails in the UK are the intermediate host for canine lungworm (Angiostrongylus vasorum). I have to admit my answer was I didn’t know for certain what the risk was if any, but I did know that amphibians such as frogs could act as an intermediate host when preying on infected slugs and snails. 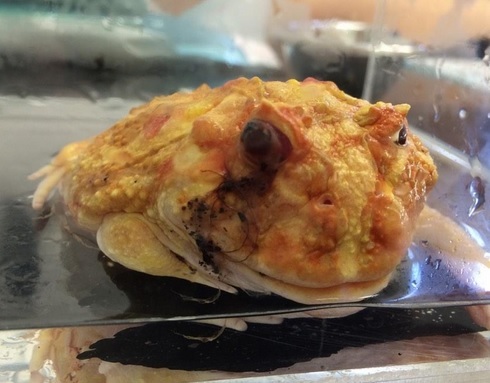 I also knew of certain other parasites of the lungs and circulatory system that specifically infect reptiles so thought I would write a short blog post to clear up any concerns. The canine lungworm (A. vasorum) requires that the eggs shed in faeces of the primary mammalian host (dog or fox) are ingested in the environment by an intermediate mollusc host such as a slug or snail. The parasite then undergoes a further stage of development in the snail host before shedding infective cysts into the environment in the hope that these are ingested again by a canine such as a dog or fox. 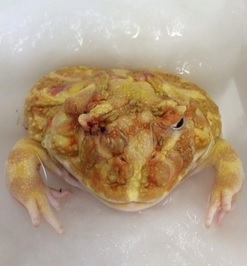 However, there is evidence that UK common frogs act as a host for the parasite also, either as an intermediate host like the snail or as a paratenic host depending which infective stage it becomes infected by (http://link.springer.com/article/10.1007%2FBF00931834?LI=true). Anyway, back to canine lungworm and feeding snails to pet reptiles, or amphibians for that matter. There have not been many studies into the effects of this parasite on reptiles mainly because there are no apparent economic reasons to undertake such studies, although it has been recognised that they can act as paratenic hosts. Because the common frog has been proven to act as both paratenic and intermediate host, presumably with the subsequent changes associated with infection above, I would warn against feeding native wild caught slugs and snails to captive reptiles and amphibians as a result. If the frog can act as both intermediate and paratenic host then it is likely that native reptiles can, and by default I would suggest that non-native amphibians and reptiles could also be at risk. The likelihood is that even if captive reptiles do not have any ill effects, over time the parasite burden may become heavy resulting in debilitation or complicating other health issues, and could even act as a reservoir of infection for dogs in the household. Equally, as the effects of infection are not known it is better to be safe than sorry, and so finding alternatives to using wild snails and slugs is probably the safest option. One method would be culturing your own mollusc supply, using either Giant African Land Snails which are readily available and easy to culture, or obtaining a supply of edible snails from the restaurant supply trade and culturing these at home as a food source for your reptile pets, many of which specialise or at least are adapted to consuming such prey in the wild. Caiman Lizards, skinks, certain Chameleons, salamanders and frogs all relish snails and slugs in their diet. If you are considering feeding such items a captive bred clean supply is probably the best source. It is also important to beware feeding wild snails and slugs due to the risk of slug bait poisons and insecticide or herbicide residues, even if you don’t use them in your own garden. You would be surprised how far a hungry slug can travel, and can’t always be sure your neighbours are as environmentally-minded or pet-conscious with their use of chemicals. Apart from the possible risk of infection with canine lungworm, reptiles and amhibians can become infected with specialised lungworm parasites of their own leading to ill health and even death in some cases. 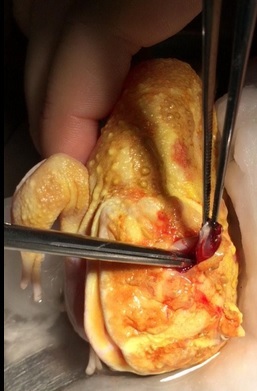 It is important to be aware of the risk of parasites in general in captive reptiles, and routine parasite screens should be carried out on any new additions to a collection as well as annual or biannual screening tests in large collections. Protozoan infections, roundworms, tapeworms and pinworms are the most common offenders, but lungworm infections are also being diagnosed more and more frequently in the reptile trade. Reptile lungworms include Rhabdias spp. in snakes and Entamelas spp. in lizards. They are spread by direct transmission, differing from the canine lungworm in that they have no intermediate host. 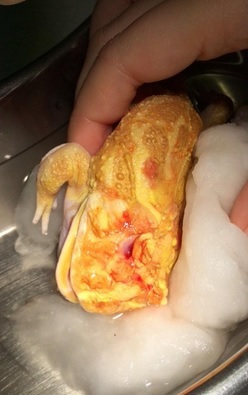 Eggs shed in faeces are directly infectious to the host reptile and other uninfected individuals that come in contact with this environmental contamination. Infection occurs through ingestion of faecal contaminated material or direct penetration by the larvae through the skin of the host. This mode of transmission means it is extremely easy to unwittingly spread the parasite widely through a large reptile collection. The most common findings in infected individuals are respiratory signs such as gaping, wheezing, foamy secretions from the airway and respiratory distress resulting from pneumonia. It is important to consider this parasite as a potential factor in respiratory infections that are longstanding or do not respond to standard effective treatments. As with most parasites, the eggs of the parasite are easily found on routine faecal examination or sometimes by examining saliva and respiratory secretions under the microscope. 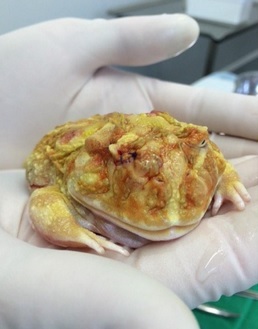 Reptiles that show these symptoms should always be isolated from healthy animals. Quarantining wild-caught or new additions to a collection is always recommended. If any of the above symptoms are noticed or if your reptile is generally unwell and fails to thrive a faecal parasite screen and examination by a competent, experienced vet is recommended. I hope this topic was of interest and if you have any other suggestions for blog topics please leave them in the comments or on our Facebook or Twitter pages at Sean McCormack Mvb and @ExoticPetVet.